Places4Students.com is the proven Off-Campus Housing Listings Resource for over 160 college and university campuses throughout North America. This established listing service has been operational since 2003. Since then, we have helped over 100,000 landlords and property management companies advertise their housing vacancies to students effectively. What’s our edge in this niche market? Our partnership with academic institutions and student associations provides more than just an off-campus housing option for their students - it includes online resources, exceptional customer service, proven marketing techniques, active social media engagement with students, IT support, detailed reporting and industry expertise. We serve as each school's exclusive Off-Campus Housing Service and handle all the administrative responsibilities! Listings are up-to-date; descriptive with 24 photos, virtual reality tours, amenity icons, floor plans and include mapping from each rental property to campus; Smart and Map Search features, mobile app and much more! 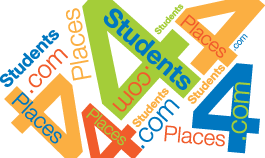 Places4Students.com was created within a college and university environment. We truly have the greatest understanding of student, school and landlord’s off-campus housing needs. We are a young, energetic and vibrant team that is bringing a niche and exclusive service to the college and university community. All our website development, upgrades and maintenance are performed in-house by our experienced IT team. Places4Students.com focuses 100% of our efforts on providing students, schools, student associations and landlords with off-campus housing solutions. Our service is completely fluid to meet the individual needs of each college or university we partner with. Each partner’s webpage is branded with its logo and information, to serve as an extension of its official website. All services are provided to student associations and academic institutions for FREE when revenue sharing, plus our team assumes all the administrative costs and responsibilities associated with operating the service. Revenue sharing partners receive a percentage of the profits generated from the listings posted for their school, starting with the very first listing! We’re HELPING STUDENTS FIND A HOME AWAY FROM HOME!